TS TRT School Assistants SA Ranks of District Wise, Subject wise, Caste wise Merit list 2018: TS TRT School Assistants SAs Biology Mathematics Physical Science Telugu Hindi English Subjects Merit list Rank of District Wise, Subject wise, Caste wise Ranks: TS has released TRT SA General Merit list. TSPSC TRT SA Subject wise Ranking lists Results 2018 announced (School Assistants). 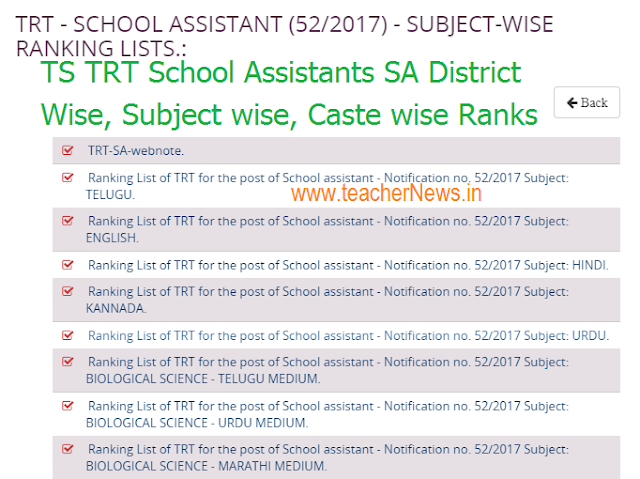 TSPSC TRT School Assistants Subject wise Ranking lists Results 2018 Download here. TSPSC TRT School Assistants Recruitment Subject wise Ranking lists Results 2018 announced: TSPSC has announced the Ranking List of TRT for the post of School Assistant Merit list and Selection list. TSPSC TRT School Assistants SAs District Wise, Subject wise, Caste wise Ranks TRT SA DISTRICT RANKS June 09 2018 TSPSC has released TRT SA General merit list. We have prepared TRT SA District Ranks. 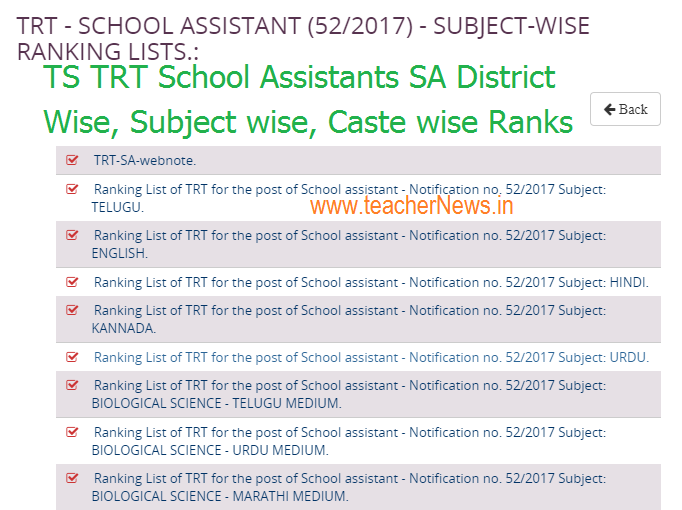  Ranking List of TRT for the post of School assistant - Notification no. 52/2017 Subject: TELUGU.  Ranking List of TRT for the post of School assistant - Notification no. 52/2017 Subject: ENGLISH.  Ranking List of TRT for the post of School assistant - Notification no. 52/2017 Subject: HINDI.  Ranking List of TRT for the post of School assistant - Notification no. 52/2017 Subject: KANNADA.  Ranking List of TRT for the post of School assistant - Notification no. 52/2017 Subject: URDU.  Ranking List of TRT for the post of School assistant - Notification no. 52/2017 Subject: BIOLOGICAL SCIENCE - TELUGU MEDIUM.  Ranking List of TRT for the post of School assistant - Notification no. 52/2017 Subject: BIOLOGICAL SCIENCE - URDU MEDIUM.  Ranking List of TRT for the post of School assistant - Notification no. 52/2017 Subject: BIOLOGICAL SCIENCE - MARATHI MEDIUM.  Ranking List of TRT for the post of School assistant - Notification no. 52/2017 Subject: BIOLOGICAL SCIENCE - KANNADA MEDIUM.  Ranking List of TRT for the post of School assistant - Notification no. 52/2017 Subject: MATHEMATICS - TELUGU MEDIUM.  Ranking List of TRT for the post of School assistant - Notification no. 52/2017 Subject: MATHEMATICS - ENGLISH MEDIUM.  Ranking List of TRT for the post of School assistant - Notification no. 52/2017 Subject: MATHEMATICS - URDU MEDIUM.  Ranking List of TRT for the post of School assistant - Notification no. 52/2017 Subject: MATHEMATICS - KANNADA MEDIUM.  Ranking List of TRT for the post of School assistant - Notification no. 52/2017 Subject: MATHEMATICS - MARATHI MEDIUM.  Ranking List of TRT for the post of School assistant - Notification no. 52/2017 Subject: MATHEMATICS - HINDI MEDIUM.  Ranking List of TRT for the post of School assistant - Notification no. 52/2017 Subject: MATHEMATICS - TAMIL MEDIUM.  Ranking List of TRT for the post of School assistant - Notification no. 52/2017 Subject: SOCIAL STUDIES - TELUGU MEDIUM.  Ranking List of TRT for the post of School assistant - Notification no. 52/2017 Subject: SOCIAL STUDIES - ENGLISH MEDIUM.  Ranking List of TRT for the post of School assistant - Notification no. 52/2017 Subject: SOCIAL STUDIES - MARATHI MEDIUM.  Ranking List of TRT for the post of School assistant - Notification no. 52/2017 Subject: SOCIAL STUDIES - URDU MEDIUM.  Ranking List of TRT for the post of School assistant - Notification no. 52/2017 Subject: SOCIAL STUDIES - HINDI MEDIUM.  Ranking List of TRT for the post of School assistant - Notification no. 52/2017 Subject: SOCIAL STUDIES - TAMIL MEDIUM.  Ranking List of TRT for the post of School assistant - Notification no. 52/2017 Subject: PHYSICAL SCIENCE - TELUGU MEDIUM.  Ranking List of TRT for the post of School assistant - Notification no. 52/2017 Subject: PHYSICAL SCIENCE - ENGLISH MEDIUM.  Ranking List of TRT for the post of School assistant - Notification no. 52/2017 Subject: PHYSICAL SCIENCE - URDU MEDIUM.  Ranking List of TRT for the post of School assistant - Notification no. 52/2017 Subject: PHYSICAL SCIENCE - HINDI MEDIUM.  Ranking List of TRT for the post of School assistant - Notification no. 52/2017 Subject: PHYSICAL SCIENCE - MARATHI MEDIUM. TS TRT School Assistants SAs Biology Mathematics Physical Science Telugu Hindi English Subjects Merit list Rank of District Wise, Subject wise, Caste wise Ranks at tspsc.gov.in.